"Discover How YOU Can STOP Stressing About Starting A Business And START Your Very Own Profitable Business With The Help Of 50 Experts - Even If You Don't Have Much Money Or Experience!" It's a rough world out there, isn't it? If you're working for a company right now, you're probably living with the threat of a layoff hanging over your head. Worse yet, even if you aren't caught in a layoff, you have picked up the slack for those who were laid offso you're putting in a lot of extra hours. And maybe you get paid for that extra work, but probably not. Or perhaps you've lost your job already and you need a source of income? You want to start your own business so you can live the lifestyle of your dreams, but where do you begin? When do you set up an LLC or an S Corporation? How do you raise capital? What about PR or getting web traffic? Frankly, it can become so overwhelming that the majority of would-be entrepreneurs never even get of the ground. Start Your Own Successful Business? Sure, starting a business can seem overwhelming. And you've probably heard that it's risky. How successful do you think you could be if you could leverage the amazing power of 50 different business experts to help start your own business? Think You Already Know How To Start A Business? Do you know the 7 steps you MUST TAKE before you start your business? Do you know how to create a business plan that pulls in the financing you need? Do you know 43 ways to find a good lender ? Do you know why you might want to buy an existing business instead of starting one? Do you know how to use factoring to grow your business? Do you know how to eliminate objections to price ? Do you know how to choose the right SEO firm ? Listen, I'm going to be very blunt hereif you can't answer those questions, then your chances of success aren't very high. To start your own business, you need to know the all-important steps to take in getting a business started. You also need to know how to use marketing to boost sales , along with some knowledge of sales psychology to get customers to buy from you. And, of course, you need to know how to make sure your customers actually WANT what you're selling. To Help You Make Millions! I've written this comprehensive ebook in response to HUGE need I've seen from the 300,000 entrepreneurs just like you who visit my site every day. If you're like most of my visitors, you've either got an idea for a business and need help developing it, or you've already got a business but you're struggling to punch through the barriers to take your business to the next level. Make Your First Million50 Top Experts Share Their Best Secrets To Help You Make Millions was written for you. So What's In This Amazing New Ebook? Which Is the Lifeblood of ANY New Business! New businesses or existing businesses that want to grow MUST have access to money it's not an option, it's a requirement. But where do you find financing without a lot of scary strings attached? How to raise money on a small budget , and where to look for fundingthis one alone could save your business! If you're nervous about selling, don't worryyou're in good company! Most new entrepreneurs get butterflies in their stomach when they think of selling, did you know that? That's why I've devoted an entire chapter to How to Sell! Here's a sample of what you'll learn. How to market to people who influence your market this one can REALLY multiply your sales fast! Yes, you CAN generate tons of media attention for your small business start up. It's all there in Make Your First Million . How to get TV coverage and why it's not as hard as you think! Increasing web traffic is a surefire way to increase salesbut how do you do it? 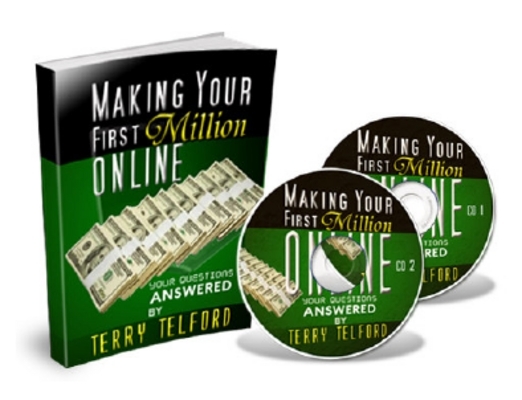 In Make Your First Million , you'll learn the ins and outs of generating HUGE traffic. How to profit by promoting your products with an organic searchand doing it cost-effectively! plus a FREE bonus article on the Top Ten Tips for Outstanding Customer Service! In This Unique New Ebook Be? With 50 experts on board this information-packed 137-page ebook, I'd be well within my rights to charge at least $50 for it. And really, if you went to these experts individually, the cost could easily exceed $1,000. But I know that when you're starting a new business , every single dollar counts, and you're probably stretched a little thin already, am I right? So to help you get started the right way and avoid nasty pitfalls , I'm only asking $12.95 for this amazing new ebook. That is not a typo. I said $12.95! For the cost of about 2 reams of printer paper, or 3 lattes, you can have 50 experts helping you start your business. Unbelievable, isn't it? Of Make Your First Million! Look, I'm dead serious about putting all the right tools in your hands because I'd like to see more entrepreneurs like you succeed instead of floundering. So just to make sure you have EVERYTHING you need to start your business, I'm offering 23 sweet Bonuses. You read that right, I said 23! Bonus #1: Top 10 Tips for your PR Program value: $30 - yours FREE! Bonus #2: The Six Greatest PR Myths - value: $47 - yours FREE! Bonus #3: Solutions to Your Everyday Selling Issues - value: $100 - yours FREE! Bonus #4: Are You Ready to Start a Business E-Report - value: $44 - yours FREE! Bonus #5: I Need to Start Cold Calling Transcript, PLUS Handout, PLUS MP3 - combined value: $57 - yours FREE! Bonus #6: Where the Money Is & How to Get There - value: $9 --yours FREE! Bonus #7: Bootstrap-Marketing, Online-Marketing, Business-Growth (3 MP3 files) - value: $47 - yours FREE! Bonus #8: Secrets Of Telemarketing Success - value: $37 yours FREE! Bonus #9: Top 10 Urgent Questions to Answer About Your Web Site - value: $20 - yours FREE! Bonus #10: SEO Lessons - value: $60 - yours FREE! Bonus #11: Joint-Adventures - How Anyone Can Create Financial Freedom With No Cost or Risk, Using Joint Ventures - value: $15 - yours FREE! Bonus #12: Marketing Secrets - How to Market Yourself Through Articles Without all the Fluff - value: $20 - yours FREE! Bonus #13: 18 Keys To A Rejection-Proof Submission - value: $40 - yours FREE! Bonus #14: Four-Keys-to-Big-Business-Success (MP3) - value: $57 - yours FREE! Bonus #15: The Product/Service Life Cycle Explained value: $7 - yours FREE! Bonus #16: SEO-3: Business Implications value: $27 - yours FREE! Bonus #17: Content Challenged No More - Over 100 Content Ideas for Your Web Site value: $31 - yours FREE! Bonus #18: Special Report: Public Relations and the Role of the Media - value: $30 - yours FREE! Bonus #19: Creative Brief Template, Justifying fees - value: $7 - yours FREE! Bonus #20: Quick PR Guide - value: $7 - yours FREE! Bonus #21: Everything I Know About Business I Learned From My Mama Sample Chapters - value: $7 - yours FREE! Bonus #22: Book Promotion Questionaire - value: $7 - yours FREE! Bonus #23: Sample Surrender Letter - value: $7 - yours FREE! that's a total of $713 in Bonuses , and they're YOURS FREE when you order Make Your First Million! Of "Make Your First Million" ! OK, I'm nearly done, but let me just say that with all the great information packed into this unique 137-page ebook by 50 experts, and 23 value-packed bonuses, it's a complete no-brainer to BUY THIS EBOOK! And a word to the wiseI may raise the price at any time. You might come back tomorrow and it might cost you $20 or $30, or who knows? Order now, and get this tremendous resource that you need to start your own business! P.S. Don't forgetI'm offering you the unique opportunity to access the expertise of 50 business experts so you can start your own business the right way and avoid pitfalls! Click here and order NOW. P.P.S. What are you waiting for? You're getting 23 incredible bonuses with this amazing new ebook, and the cost is very low compared to other ebooks. Click here and order NOW.